Documentary filming of The Shoreham Adur Tidal Walls Scheme. 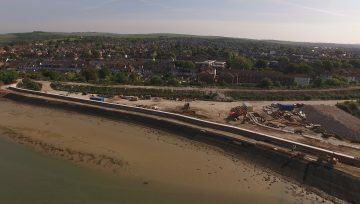 Take One Productions have been busy over the last two years filming and producing a series of documentaries which capture the progress and results of the Shoreham Adur Tidal Walls Scheme. In 2016 after many years in the planning, the scheme to reduce the flood risk in Shoreham, Lancing and the surrounding areas was put into action. Flood defences along a 7.2 Km stretch of the River Arun have been replaced and raised using a mix of construction techniques. The scheme will provide protection for extreme events with 0.33% probability (1-in-300-year) of occurring in 1 year, allowing for 50 years of sea-level rise. 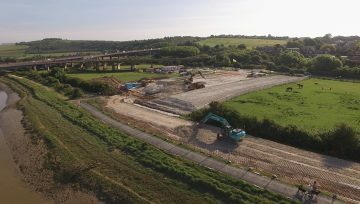 The Environment Agency has worked in partnership with West Sussex County Council and Adur District Council to design and build the new defences. The Coast to Capital Local Enterprise Partnership has also contributed funding to the scheme.(https://www.gov.uk/government/publications/shoreham-adur-tidal-walls-scheme/shoreham-adur-tidal-walls-scheme). Shoreham Adur Tidal Walls Scheme. How were Take One Productions involved? 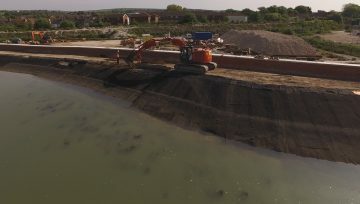 Filming interviews with key personnel and stakeholders and using a mix of drone technology, animation, time lapse and multi-camera set-ups, we have captured the project from start to finish. Nick Webber who managed the filming project states “The biggest battle was out-smarting Mother-Nature! Filming has taken place over 2 years, throughout the 4 seasons. Planning to film the various key stages of construction around the tides, wind and rain has proved a challenge at times”. “However I am pleased to say the project has been a resounding success and Take One has been privileged to be involved”.